Adhesive and Material Converting for Medical Packaging Applications Packaging | Fabrico, A Division of EIS, Inc.
Fabrico Medical provides the medical packaging expertise, materials, adhesives, and equipment to help medical OEMs and contract manufacturers produce the exact packaging their product requires. With access to the world’s leading materials and adhesive suppliers, including DuPont Medical, 3M™, Adhesives Research Medical, and more, Fabrico Medical converts materials including DuPont™ Tyvek®, single and multilayer films, medical grade papers, and multilayer laminations that might include film, paper, and foil. Fabrico Medical offers precision die-cutting to very close tolerances, laser cutting, die-less cutting, and water jet cutting for different material specifications and tolerances. 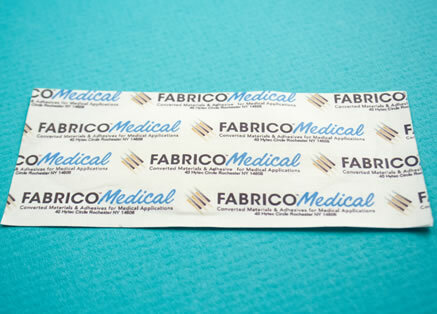 Fabrico Medical provides slitting, laminating, sheeting, perforating, ultrasonic welding, forming and bending, and more. 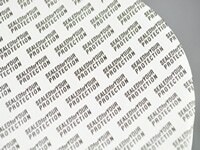 Printing and labeling ensures that a medical packaging application can be taken from design through kitting and delivery. With three Class 10,000 clean rooms, FDA compliance, and ISO 13485 certification, Fabrico Medical is ready to help you meet federal regulations and standards.